Of all the movies I’ve reviewed for this blog, this one may be the most difficult for modern viewers to accept. 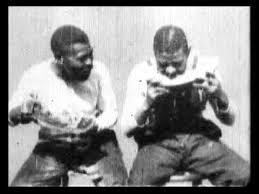 Even “The Birth of a Nation” has its defenders who claim it is a “classic” or “great” movie, but no one is likely to say that about the “Watermelon Eating Contest.” It plays right into racist stereotypes which make the watermelon a symbol for African American “inferiority” and simplicity, and it does so unapologetically. Charles Musser tells us in “The Emergence of Cinema” that even at the time, viewers in some areas found it “nasty and vulgar because of the spitting and slobbering,” although they were not apparently alarmed by its racism. Indeed, one suspects that these (presumably white) viewers reacted to it in part for the simple effrontery of depicting African Americans at all. I think it’s important to note, however, because the ways in which blacks have been portrayed on film holds a mirror up to the face of America’s racial politics. This is the earliest example I know of, and it sets a low bar for filmmakers to improve on in the coming century and beyond. You can watch it for free: here (fair warning: you may find it offensive or upsetting).